Elizabeth talks with Paul about his behind the scenes look at the giant Lufthansa Cargo and Maintenance facility at the Frankfurt airport. Find out if he really did get to tour the Animal Lounge and kick the tires on the 747-8. Actually he only gently stroked one. Kicking seemed a bit risky. There will be more on both Lufthansa, Frankfurt Airport and the new Boeing 747-8 on future shows. 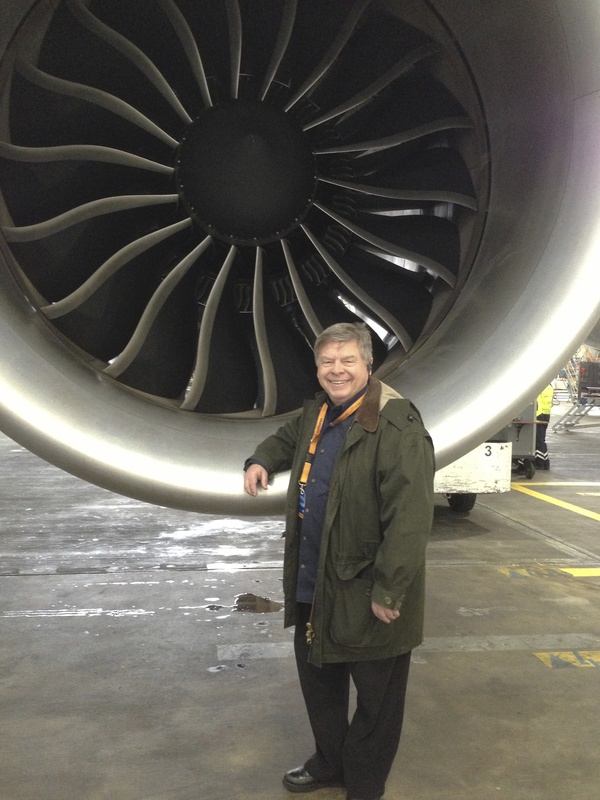 One thing is clear, you can’t sense how big a 747 really is until you walk underneath it or perhaps lean in front of an engine. 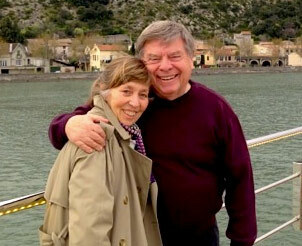 Contributing correspondent to Traveling and Executive Editor of Smarter Travel.com, Ann Banas chats with Paul and Elizabeth about the few remaining airlines that still serve snacks and even real food in the air. All three of us agree that the best inflight food even in this day and age is to be found on Hawaiian Airlines. And then Anne told us about an airline we haven’t flown but definitely will. Porter Airlines. The free-snack options on Porter will have you wishing the Canadian carrier served more U.S. cities. Almonds, vegetable chips, and cookies are standard complimentary options. During meal times, the airline offers snack boxes that include pastries, fruit, and yogurt for breakfast and sandwiches, salads, and chocolates for lunch and dinner. You don’t have to wait until you’re in the air for free treats, either: Porter’s three airport lounges (in Toronto, Ottawa, and Newark) are free for departing passengers and stocked with snacks such as chocolate-chip shortbread cookies and espresso drinks. TSA Administrator John S. Pistole talks with Paul and Elizabeth at the event marking the opening of new security pre check lanes at John Wayne Airport in Orange County, California. Pistole talks about the need for vigilant screening but also a sensible approach to being able to assess risk and narrow the numbers of passengers undergoing intensive screening procedures. This should speed security times and make the process easier for the majority of airline passengers. They also talk about the growing success of Global Entry. For more information and to get accurate and up to the minute answers to questions check out the TSA Website. 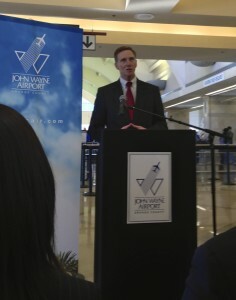 Here is the complete press release concerning the program at John Wayne Airport. WASHINGTON – The Transportation Security Administration (TSA) today announced that John Wayne Airport (SNA) is the 35th airport in the nation to offer TSA Pre✓™ to eligible passengers. Under TSA Pre✓™ U.S. citizens traveling domestically who are select Alaska Airlines, American Airlines, Delta Air Lines, United Airlines and US Airways frequent travelers or members of U.S. Customs and Border Protection (CBP) Trusted Traveler programs are now eligible to participate and may receive expedited screening benefits. The TSA Pre✓™ lane is now available at Checkpoint A.
TSA Pre✓™ is part of the agency’s larger effort to implement risk-based security concepts that enhance security by focusing efforts on travelers considered higher risk and about whom the agency knows less. To date, more than 5 million passengers have experienced TSA Pre✓™. TSA Pre✓™ is now available in 35 airports for Alaska, American, Delta, United and US Airways frequent flyers. Eligible passengers include U.S. citizens flying on participating airlines as well as those who are members of CBP Trusted Traveler programs, including Global Entry, SENTRI and NEXUS. As of November 15, Canadian citizens traveling domestically in the United States who are members of NEXUS are also qualified to participate in TSA Pre✓™. Individuals interested in participating can apply by visiting www.globalentry.gov. If TSA determines a passenger is eligible for expedited screening through the TSA Pre✓™ pre-screening process, information is imbedded in the barcode of the passenger’s boarding pass. TSA reads the barcode at the designated checkpoint and the passenger may be referred to the TSA Pre✓™ lane where they will undergo expedited screening, which could include being able to leave their shoes, light outerwear and belt on, allowing them to keep their laptop in its case and their 3-1-1 compliant liquids/gels bag in a carry-on. TSA has expanded TSA Pre✓™ benefits to U.S. military active duty members traveling through Charlotte Douglas International, Hartsfield-Jackson Atlanta International Airport, Honolulu International, Ronald Reagan Washington National, Seattle-Tacoma International and Washington Dulles International airports. Other TSA risk-based security measures, in addition to TSA Pre✓™, include modified screening procedures for passengers 12 and younger and 75 and older. The Transportation Security Administration (TSA) was created in the wake of September 11, 2001, to strengthen the security of the nation’s transportation systems and ensure the freedom of movement for people and commerce. Today, TSA secures the nation’s airports and screens all commercial airline passengers and baggage. TSA uses a risk-based strategy and works closely with transportation, law enforcement and intelligence communities to set the standard for excellence in transportation security. TSA’s workforce is comprised of approximately 50,000 frontline officers who screen approximately 1.8 million travelers each day at more than 450 airports nationwide. For more information about TSA, please visit our website at www.tsa.gov. Paul chats with Mats Jacobsen, international sales vice president for Air Berlin on the inaugural from Los Angeles to Berlin in May. Mat’s talks about the beginnings of the airline in Oregon in 1978 and how it has grown to be the second largest airline in Germany. Frequent contributor to Traveling, Norm Sklarewitz, joins in to provide a prospective on why Air Berlin has prospered and why it is expanding. The first inflight meal service was served 85 years ago. Paul and Elizabeth chat with Simon Talling–Smith the head of British Airways in North America about the advances in in-flight meals service since then. British Airways has been a leader in creating new menus over the years and also in researching just how food tastes at 35,000 in an airline cabin. You might be surprised. Incidentally it was in 1927 that Imperial Airways, a predecessor to British Airways first served food on a two-hour flight from London to Paris. A male steward dressed in a smart white tunic served just ten passengers on the flight. Onboard was a small cabinet carrying four gills (servings) of whisky, a dozen bottles of lager beer, two siphons of sparkling water and twelve assorted bottles of mineral water. They was a packet of sandwiches, some biscuits and one or two thermos flasks of hot water, within which the steward made coffee or beef tea to nourish the passengers during the flight. The service represented the height of luxury since before this you had to take any food you wanted on the flight yourself. Today, British Airways’ cabin crews serve around 100,000 meals a day. There is a collection of historical information at British Airways’ head office and is open to members of the public. Information about the collection can be found online at www.ba.com/heritage. American Airlines’ new Flagship® Check-in at Los Angeles International Airport is nothing short of spectacular. Paul chats with American Airlines exec, John Tiliacos about how the employes got together to create the new space almost overnight. There’s a separate curbside entrance with drive-up and drop-off convenience complete with a doorman on the day we were there, and inside you’ll find dedicated customer service representatives to assist with your individual travel needs and best of all an exclusive security line to expedite security clearance. Of course it helps to be flying first class, but anyone using our favorite Five Star service can check in as well. For everyone flying American no matter in what class it becomes a much better check-in experience. Ever wonder what it would be like to work as a flight attendant on a long haul flight? 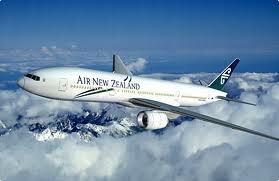 Paul finds out as he interviews the flight crew of an Air New Zealand Los Angeles to Auckland non stop flight. He finds an amazing group of Kiwis who are dedicated to their jobs and who love flying. Paul talks with crew in business class and economy and learns just why Air New Zealand has earned a reputation as one of the world’s great airlines. For years American Airlines and its employees have worked with veteran’s groups to provide philanthropic services for military personnel. 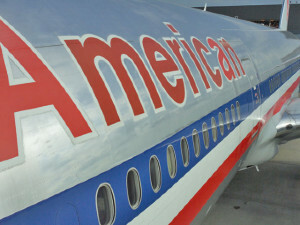 Captain Steve Blankenship, Managing Director – Veterans Initiatives at America Airlines chats with Paul about recent initiatives the program has undertaken. A recent effort was a joint effort with Ride 2 Recovery, an organization which took a group of injured veterans to France to ride on part of the course of the Tour de France. In part two Paul is joined by Mike McNaughton, VP of Veterans Affairs for Ride 2 Recovery.